pH in the proper range of 8.1 – 8.4. Such stabilization is also called buffering. 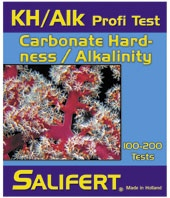 The Salifert KH + pH Buffer makes correction of the alkalinity or carbonate hardness simple and does not upset the pH of the system. Within 24 hours it will acquire the pH corresponding to other aquarium parameters. Should the pH remain low within 24 hours of corrective measures then an insufficient gaseous exchange (inefficient aeration) is quite often the cause.